May 08, 2015. KDE today announces the release of KDE Frameworks 5.10.0. New cmake macro kcoreaddons_add_plugin to create KPluginLoader-based plugins more easily. Fix crash in texture cache. Add new method globalShortcut which retrieves the shortcut as defined in global settings. Asynchronous QIODevice-based data fetch for KIO::storedPut and KIO::AccessManager::put. New set of classes, called KMoreTools and related. KMoreTools helps to add hints about external tools which are potentially not yet installed. Furthermore, it makes long menus shorter by providing a main and more section which is also user-configurable. Use KPluginFactory for instantiating the plugins, instead of KService (kept for compatibility). KDateTimeEdit: Fix so user input actually gets registered. Fix double margins. The installed headers are now organized like all other frameworks. Don't try to highlight if there is no spell checker found. This would lead to an infinite loop with rehighlighRequest timer firing constanty. Fix native file dialogs from widgets QFileDialog: ** File dialogs opened with exec() and without parent were opened, but any user-interaction was blocked in a way that no file could be selected nor the dialog closed. ** File dialogs opened with open() or show() with parent were not opened at all. 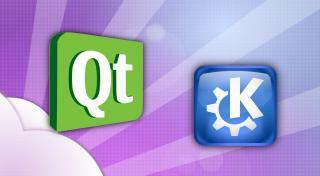 The complete source code for KDE Frameworks 5.10.0 may be freely downloaded. Instructions on compiling and installing KDE Frameworks 5.10.0 are available from the KDE Frameworks 5.10.0 Info Page. Building from source is possible using the basic cmake . ; make; make install commands. For a single Tier 1 framework, this is often the easiest solution. People interested in contributing to frameworks or tracking progress in development of the entire set are encouraged to use kdesrc-build. Frameworks 5.10.0 requires Qt 5.2.